The family story says that the Stone�s were all Quakers until Elizabeth decided she wanted to send her sons to an Episcopal school to obtain a better education. That necessitated a change of religion! In 1929, Elizabeth married Harry M. Gillelan. 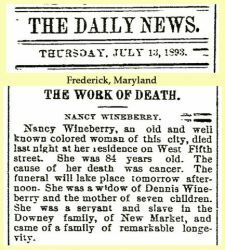 And in 1930, they lived at 41 West Main Street in Emmitsburg, Frederick Co., Maryland, in a home she owned valued at $8,000. With them lived her son Owings Stone, then clerking in a store. The census shows that they, and many others in their neighborhood, owned a radio.